What Is DA Form 2408? DA Form 2408, Equipment Log Assembly (Records) provides a list of operational symbols, duty symbols, flight condition symbols, aircraft, and Unmanned Aerial Systems (UAS) condition status symbols, and codes used on the DA Form 2408-12, DA Form 2408-13, DA Form 2408-13-1, DA Form 2408-13-2, DA Form 2408-13-3, and other related maintenance forms. The DA 2408 is a part of a series of 40 forms along with the DA Form 2408-12, Army Aviator's Flight Record, used for recording aircraft maintenance information and flight operations. The Department of the Army (DA) released the latest edition of the form - sometimes incorrectly referred to as the DD Form 2408 - in October 1997. An up-to-date DA Form 2408 is available for download below or can be found on the Army Publishing Directorate (APD) website. How To Use Da Form 2408? SOF or TB is due or overdue. Pamphlet 738-751 for detailed instructions of each code. NOTE: All functional group codes do not apply to all models. The DA 2408 provides information to assist aircrew, UAS operator, and maintenance personnel on filling out the logbook, maintenance, and historical forms, records, and files. The codes described on the DA 2408 are part of the Logistics Information System and appear in drop-down lists to help in completing the necessary forms and records. All flying duty symbols, mission symbols, and flight condition symbols can also be found in the Army Regulation 95-23 (for UAS) and Army Regulation 95-1 (for aircraft). The information in both Army Regulations takes precedence over the form if there is a conflict between codes. Additional information and DA Form 2408 instructions can be found in the Department of the Army Pamphlet 738-751 (Functional Users Manual for the Army Maintenance Management System - Aviation) released in February 2014. DA Form 2408-4-1, Weapon Record Data. DA Form 2408-4-2, Weapon Sighting Data (OH-58D). DA Form 2408-4-3, Weapon Sighting Data (AH-64A). DA Form 2408-4-4, Weapon Sighting Data (AH-64). DA Form 2408-12, Army Aviator's Flight Record. DA Form 2408-13, Aircraft Status Information Record. DA Form 2408-13-1, Aircraft Inspection and Maintenance Record. DA Form 2408-13-2, Related Maintenance Actions Record. 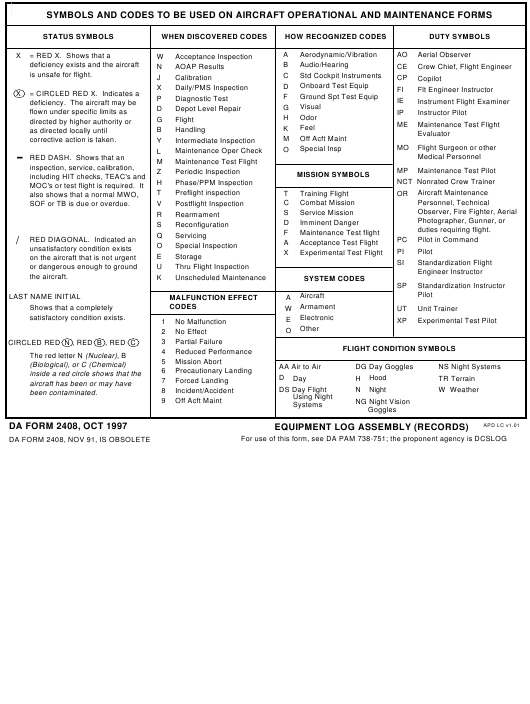 DA Form 2408-13-3, Aircraft Technical Inspection Worksheet. DA Form 2408-14-1, Uncorrected Fault Record (Aircraft). DA Form 2408-18, Equipment Inspection. DA Form 2408-31, Aircraft Identification Card.